Since 1992 we have been active in cave research at the Schwarzmooskogel in the mountain area called Totes Gebirge. There we are a sub-group of the association for speleology in Obersteier. 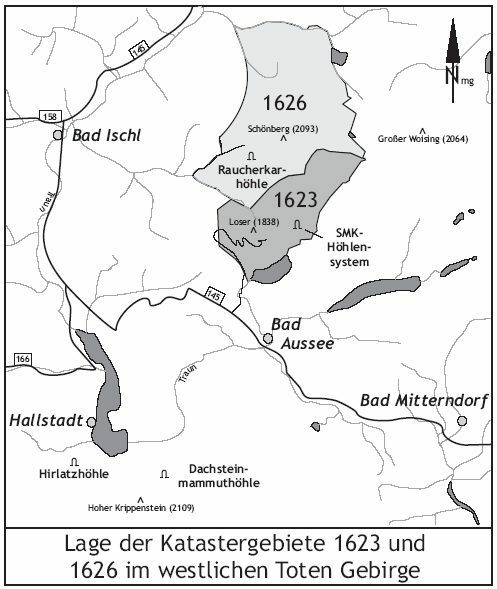 Our area of research is located in the western part of the Totes Gebirge in the so-called Salzkammergut. The main research project is the SMK system (Schwarzmooskogelhöhlensystem), showing over 63 kms of measured passages in a depth of over 1000 meters. Precise descriptions of the exploration progress can be found in the chronicle. Several separate caves belong to this system which have partly been worked on by other groups.